I went all renegade rebellious with dinner tonight, refusing to go grocery shopping and vowing to make something delicious from whatever was left on our shelves and in our fridge at the end of the week. More often then not, these experiments result in something that works for the night and is never replicated. And I have an epic failure or two on my record. I also have a husband/dining partner who is not afraid to say exactly what he does or doesn’t like about what he’s tasting. So tonight when I cobbled together a pasta dish that Chuck proclaimed was so good I should post it on the internet, I thought it would be good carbonara Karma to do so. The following is an expansion of Mark Bittman’s Spaghetti alla Carbonara recipe in How to Cook Everything. It takes about half-an-hour, contains all the food groups, and is so tasty it’s a shame that it would murder your cholesterol to eat every night. In the fridge/freezer/shelves, I foraged the ingredients: 1/2 lb. 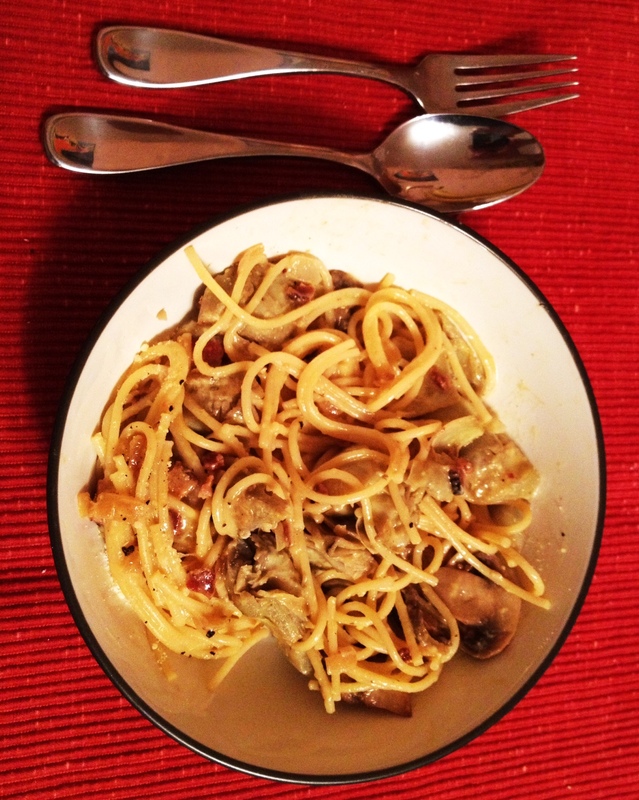 spaghetti; 2 strips thick-cut bacon; 2 eggs; 1/2 cup grated Parmesan (left from Christmas lasagna…); 1/4 onion; 5 mushrooms; 1 box frozen artichoke hearts. 1) Boil and salt water for the pasta. 2) Cook the bacon in 1 tablespoon of olive oil until crispy – set aside. 3) While the bacon is cooking, chop the onion and mushroom. Then saute in bacon pan, adding mushroom after a few minutes. Note – do not empty grease from pan before cooking. 4) When the pasta water is boiling add it in. At the same time, beat eggs and cheese together in a large heated bowl. ( I have no idea why Bittman says to heat the bowl – maybe to help cook the egg later? But I just added hot water to a bowl and dumped it out and it was nice and warm and everything came together well, so probably a step worth taking). Also at this time, cook the artichoke hearts on the stove or in the microwave. 6) As soon as the pasta is finished cooking, drain and dump into the egg-and-cheese mixture. Mix well. Add bacon, grease and all cooked vegetables. Mix again. Serve with more Parmesan and lots of pepper!